As the anticipation for the upcoming release of the Galaxy S8 continues to amplify, the Samsung leaks keep gradually stacking up – and the latest one is yet another hint the new flagship handset will come in a curved screen with little to no bezel. 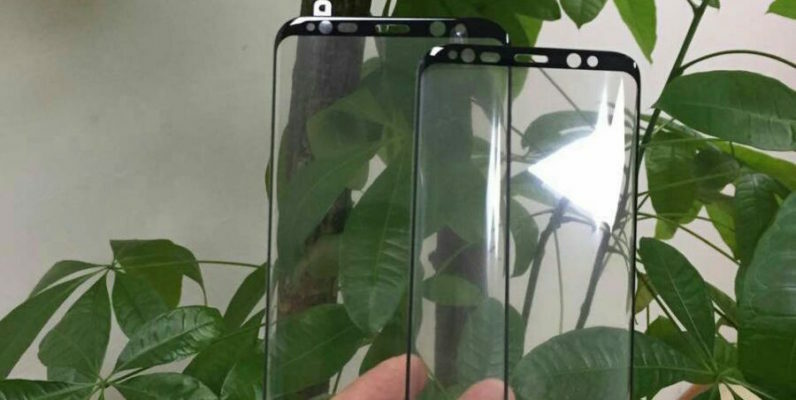 Twitter user DforDesign has posted a couple of images of what allegedly appears to be screen protector mockups, designed specifically for the yet-to-be-revealed S8. While the pictures initially popped up online a few days back, a small number of outlets picked up the news yesterday, misidentifying the photos as legitimate front panels. DforDesign has since clarified that the leaked images are merely screen protector mockups and not actual parts of the device. But there are still other conclusions to be drawn from the shape and dimensions of the screen protectors in question. Right off the bat, the leak seems to back up previous rumors suggesting Samsung might finally abandon the iconic home screen button in favor of software keys. It also seems to indicate the device will ship in two different sizes, though the actual dimensions remain unclear. The images also coincide with previous reports speculating the S8 will likely come in a curved bezel-less screen, but what is particularly intriguing about the mockup in question are the additional sensor windows at the top of the front panel, which is something we haven’t seen in earlier leaks. As AndroidPolice remarks, this detail seems to line up much closer with the sensor windows of the recently discontinued Note 7, as opposed to the S7. While subtle, the difference is important as it suggests the S8 could also sport an iris scanner – just like the Note 7. The other significant discrepancy in comparison to previous leaks is that the design of the protector screen suggests the device will arrive with fully rounded corners. While we haven’t seen this in previous leaks, AndroidPolice claims it’s confirmed this particular design detail with its sources. Samsung has so far refused to comment on any rumors about its upcoming flagship handset, which means we’ll likely have to wait for more details until Mobile World Congress in late February. Other rumors seem to suggest a delayed launch in April as well as a possible early limited release in February or March. At this point, however, the only thing that appears to be a sure thing about the upcoming Galaxy S8 is a gorgeous screen with very little bezel. As far as the rest goes, we can only speculate.